New website devoted to Digitear ! 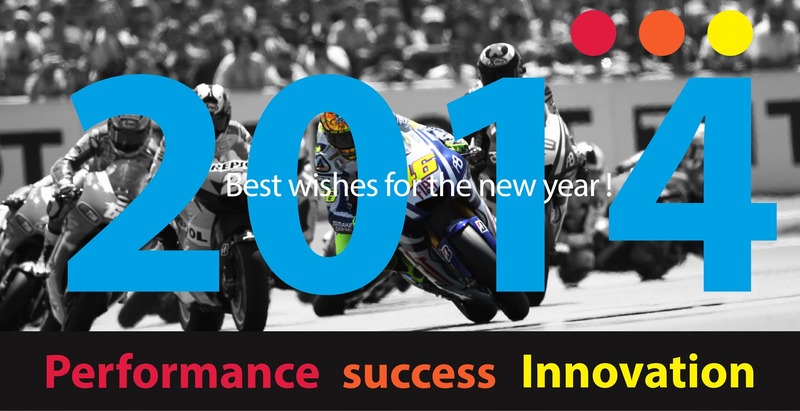 Our best wishes for a new year full of project and passion. OVERLINE SYSTEMS / 2016 JTSE: the 20th Edition! 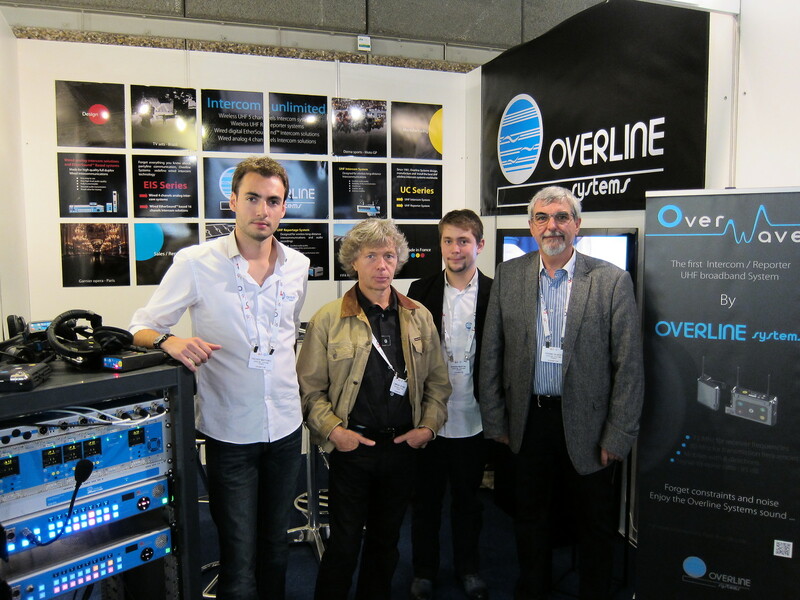 Overline Systems was exhibiting at the 20thEdition of the Journées Techniques du Spectacle et de l’Evènement (JTSE - 29& 30 November 2016). 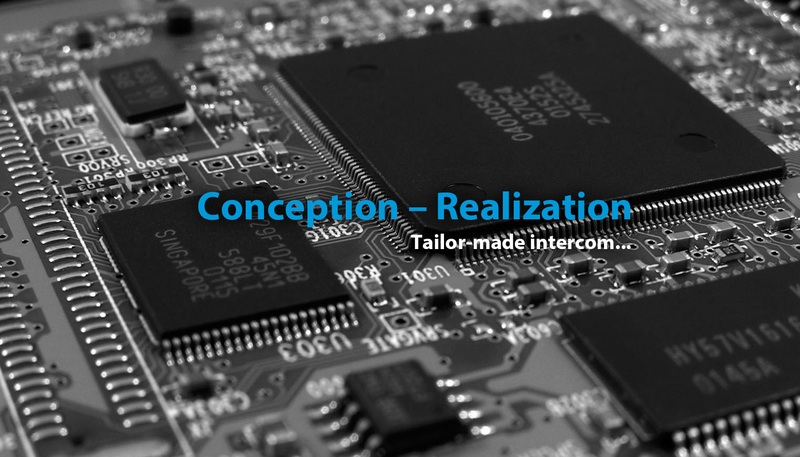 Two days ofmeetings and discussions around the topic of our new ultra-high quality Intercomsolutions! The JTSEwas the perfect opportunity to thank our faithful customers and everyonefollowing Overline Systems in all our ambitious projects for so many years. OverlineSystems is still centre stage! 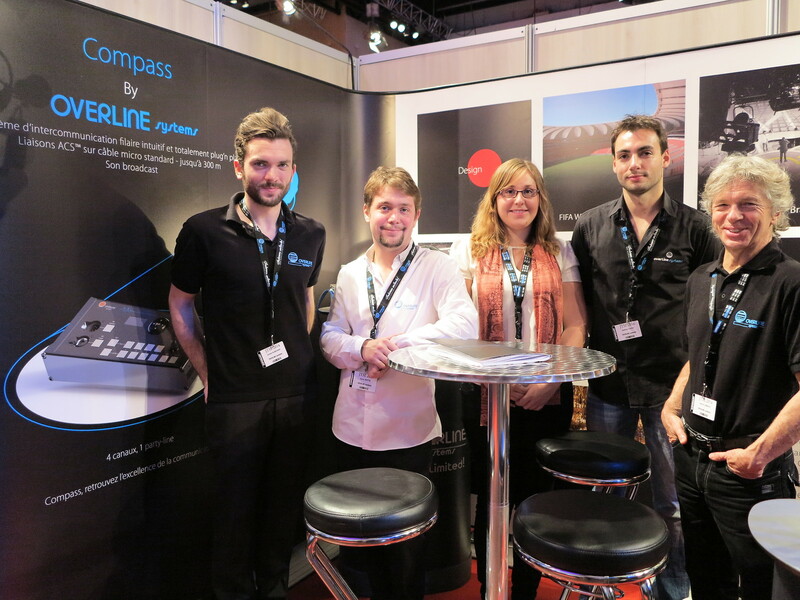 Like every year, our Team at Overlie Systems are looking forward to meeting you in Paris at the JTSE (Journées Techniques du Spectacle et de l’Evènement - 29 & 30 November), the annual meeting of technical aspects of shows and events. Visit our stand and discover all about our Compass range of plug’n play wired intercom solutions. With 4 channels and 1 party-line, rediscover excellence in communication. Join us at 7.30pm on Tuesday the 29th of November for a wine tasting of one of our collaborators’ local production. This convivial environment will be ideal to exchange and talk about our solutions as well as your expectations and technical needs. 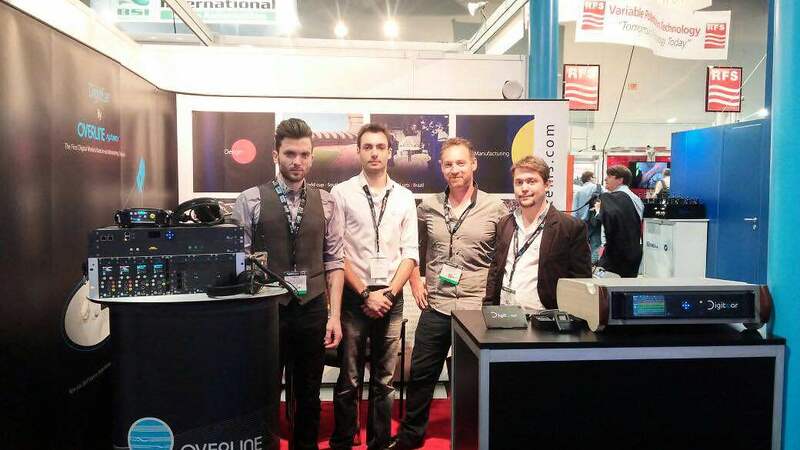 Overline Systems – Amsterdam IBC: a love story! As with every year, Overline Systems was exhibiting - together with our neighbour and partners SystemBase - at the IBC show in Amsterdam (9-13 September, 2016). It was the occasion, yet again, for some great encounters and networking. Many contacts and stimulating ideas were brought to us by our regular clients, technicians and passing visitors. They confirmed our development dynamics, aligning with the expectations and needs of our clients. DigitEar, our latest development about to be released on the market, was one of the stars of the show: it is particularly discreet but is making a great impact on the broadcasting industry. Everyone sees a specific use for this innovative device, from an antenna receiver to an intercommunication system, thanks to its ingenious talk back concept and its unmatched audio quality. DigitEar, in association with Overline Systems’ ultra-high quality OverWave broadband Intercom is offering numerous possibilities to demanding as well as creative users. It will allow them to imagine any scenario, from the wildest to the most simple. We would like to thank all the visitors who came to our stand as well as our friends and partners and all the exhibitors and technology lovers: it was a great pleasure to meet and to share this opportunity to exchange. A particular warm thank you to our regular neighbours on the exhibition: it was a renewed pleasure! 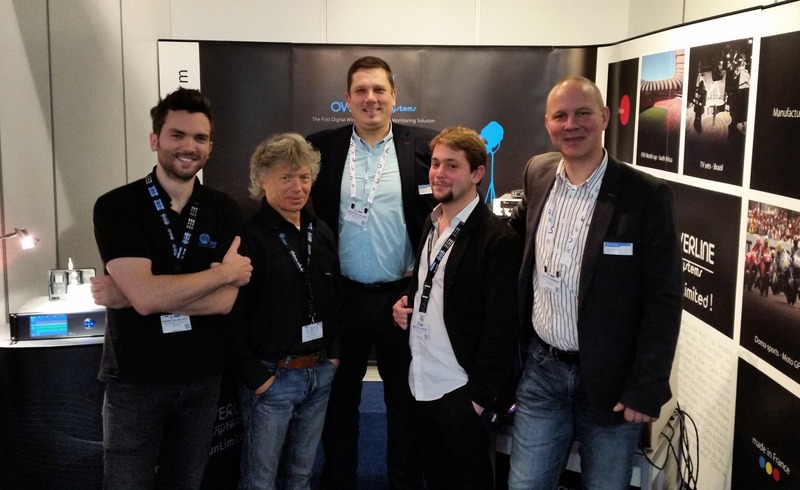 Hans de Hertogh, Sacha Blokland, Jeroen Sierjacobs, Vincent Tilgenkamp and Han Peter @ Sennheiser Benelux ; Andrew Steward @ System Base ; Gaëtan & Claire Crenier as well as Maxime Van Gorp @ WNM … See you next year in Amsterdam! IBC Show 2016, IT’S ON !!! Enter the world of tomorrow’s technologies for broadcasting and events. We’ll be presenting our latest version of OverWave intercom system, our wired solutions and the outstanding DigitEar !! Our 4th participation to the NAB Show : the adventure goes on! Overline is specialising in HF since 1981 and knows its trade! All around the globe, our ultra-high quality HF Intercom and Reportage systems have become essential to the broadcast world. You have been many to visit our stand in the North Hall of the Las Vegas Convention Centre for this 2016 edition of the NAB show. Curious and technicians alike have been able to test and appreciate the technical developments at the heart Overline’s success. A success based on a virtuous mix of innovation capacity from our R&D department and hand-on expertise from a field team in tune with users’ needs. These two keywords are Overline’s motto. Innovation and expertise are at the origine of the very promising Overline DigitEar earpiece. Developed by and for Broadcast, DigitEar will never cease to amaze! And according to the many visitors on our boot, its exceptional audio quality and wireless connexions are already above and beyond what is currently available on the market. We have appreciated the many discussions and rich exchange of ideas on the show with our European friends, all the visitors and the exhibitors, as well as our past and future partners. All of us at Overline would like to thank the participants and visitors for their keen interest in our range of products and we are looking forward to working with you in the near future! 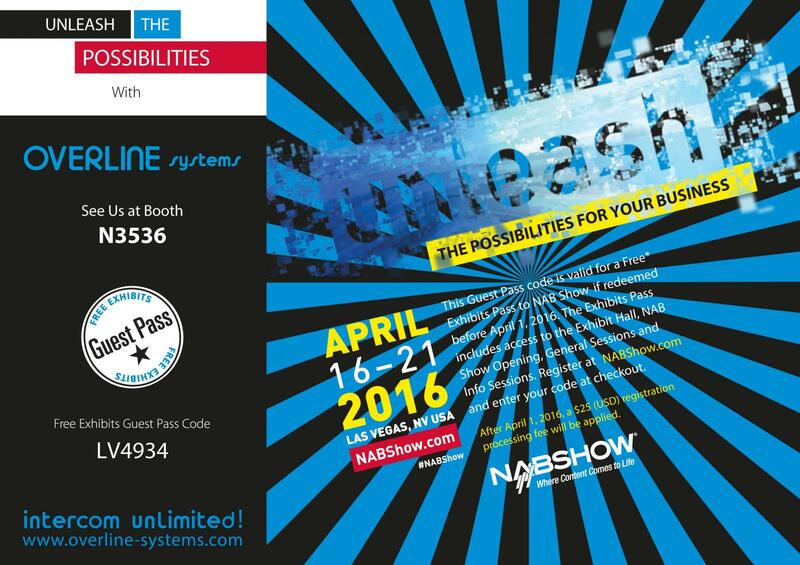 NAB Show 2016 : unleash the possibilities! Once again this year, the Overline Systems team is present at NAB Show to reveal a preview of the 2016 innovations. 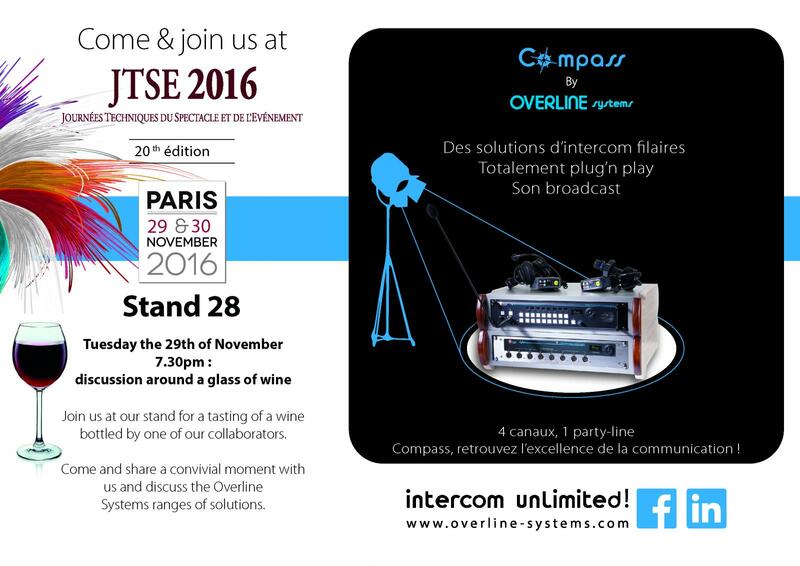 Overline Systems is proud to bring you the unbelievable IP Codecs from our English partners at SystemBase. No Limits. Just countless options! *Happy New Year 2016! For a fresh start the year, let’s go to Andernos les Bains and have a chat with our sales manager. When we describe “end-product”, he thinks “team results” because when one sees screws and electronic components, he observes the hand holding the tool, the skills, the craftsmanship. Know-how, in the noble sense, is not mechanical. Isn’t team performance based in its stability, complementarity and diversity after all? For Dorian Martial, it cannot be any other way: you go forward thanks to everyone’s specific skills. Happy New Year and… Nice To Meet You! - I have been with Overline since 2010, when I joined a small and welcoming team of dedicated people who immediately shared with me their love for their jobs and their common passion. Overline Systems is based on the banks of the Arcachon Bay in south west France. It’s another universe. Not coming from an audio-visual background, I was just amazed by the collective will and technical abilities of the company’s workforce. If you were surprised at the time and asked yourself why basing a company so far from Paris, the founder and CEO would answer: “to keep the best engineers and technicians is the best possible working environment”. - Yes indeed. I then joined Caroline Balaÿ’s technical commercial team, allowing her to concentrate her many talents on the company’s marketing and communication. I would also like to mention Gilbert Pernin, a dear friend and someone who taught me so much, both in France and overseas. Overline started to internationalise its activities and, in 2013, I was asked to fulfil the position of sales director, with the goal and challenge of overseeing the development of the company with an increasing team. - Let’s talk about evolution, rather than changes, even if many changes occurred since the setup of Overline back in… 1981! And first, let’s talk about our team. On a commercial point of view, we have recruited a sales assistant last year, Marion Amette, in charge of customer care and after sales. We have a team of three people in Paris, managing the rental and services agency at la Plaine Saint Denis’s TV studios. They are always ready for our customers, bringing advices and help if needed. Overline is not a multi-faced pyramidal structure: clients call us directly. Some of them know some of our technicians for up to 25 years. And I will let you introduced in future « Nice to Meet You » interviews our administrative & financial director, our production and purchasing manager recruited in the past few years. On the innovation side, we are now offering a complete range of HF and wired Intercom! Our wired products took a long time and many specialists to put together because our own specifications were crystal clear: to manufacture a very innovative and intuitive Intercom system fulfilling Overline System's very high audio quality standard. Four engineers worked on this project for a period of three year to get to the current system. Our new broadband HF Intercom range, the OverWave 8 Directions, was also a challenge. 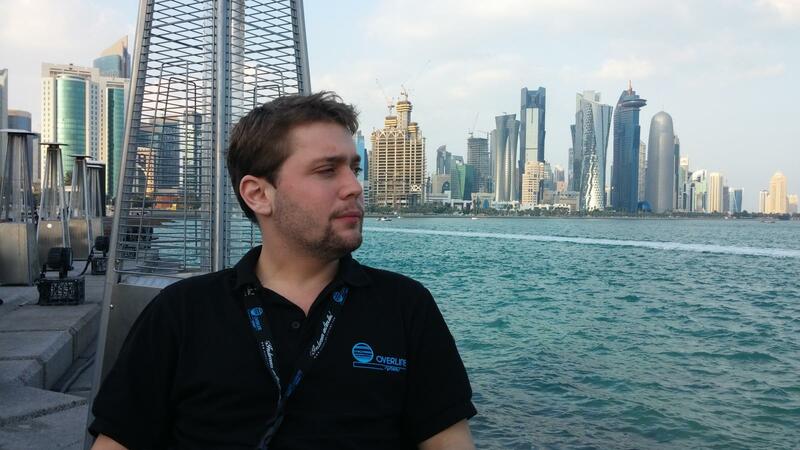 During this development, we have recruited an additional software engineer as well as another multipurpose engineer, Cédric Marin, to manage the research department and the many projects undertaken by the teams. This OverWave 8 Directions has been travelling the world for two years now, with our Spanish client DORNA, covering the Moto GP World Championship. The OverWave system is our best solution to make the most of the increasing scarcity of usable frequencies in France, in Europe and around the world. And we are currently recruiting another engineer in digital development. Digital development is one of the keys to our future. Some people may already know about our « DigitEar » prototype, a totally digital earpiece manufactured for audio return in TV studios. Let’s admit it: the priority made of the launch of our two HF Intercom ranges has impacted on the release of the DigitEar. But we are fully dedicated now, and commercialisation should begin before the end of 2016. Of course, and as usual, we will test the product in TV studios with our many clients and partners and get feedbacks in the coming months, before officially launching the DigitEar. Another project - an analog HF platform - is in the pipeline with one of our partners, but we will have other occasion to discuss this in the near future! 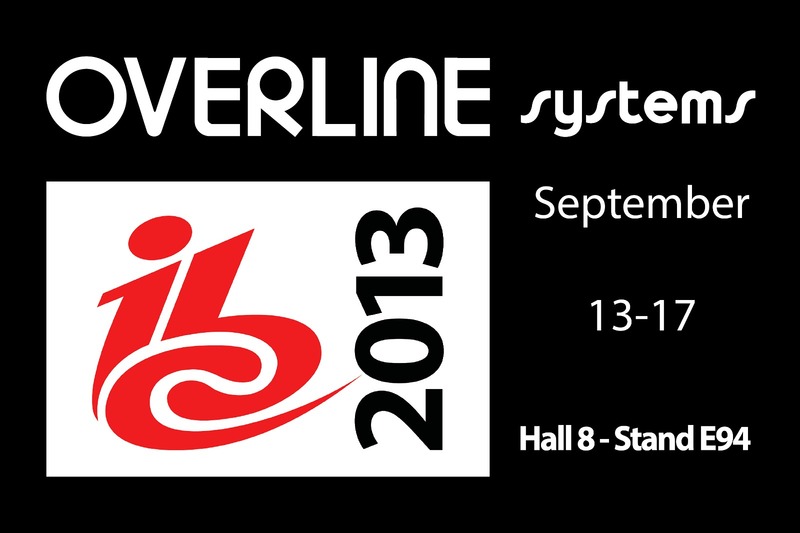 - Overline Systems has been on the IBC for many years now. It is a great show allowing us to meet with clients, current and new prospects, and with our partners, in particular with Sennheiser, our partner in the Benelux,. We have been participating to the Nabshow for only 3 years, but it is also a very interesting get together and a perfect opportunity to make your products known outside Europe. The initial and spontaneous feedback from clients and prospects discovering Overline on a show is on the audio quality of our range of products. We also get eyes wide open when we talk about the range covered by our HF mobile units. Following several on-site demos, an Australian colleague was talking about the « WOW effect ». We also had many positive feedback on our wired intercom. Many Americans prospects are still wondering how we manage 4 channels on standard mic cables without any specific configuration. I wish you a great Year 2016. More than ever, we have to show solidarity. May this New Year be the one of collective thinking. Wherever we may be, coming together brings new ideas. We will have to be imaginative together… that’s it. Most of you would know Overline Systems through its activities in broadcasting, theatre shows and other live events. 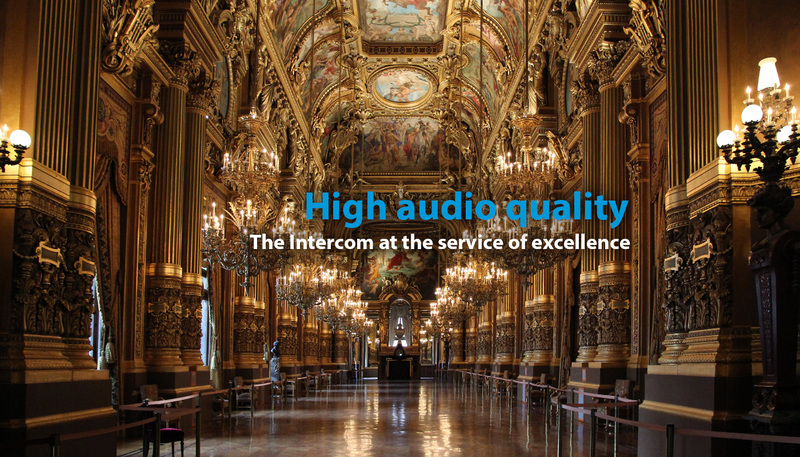 You may have seen our UC range of intercom systems in action during concerts (Les Enfoirés, the Bastille Day concert, etc.) or various sporting events around the world. But for this new “Nice to meet you” segment we enter the world of music tours, a specific category of live events only recently tackled by Overline Systems. Concert dates, live performances and being on the road virtually every day are new sets of constrains we are now dealing with, this time with the team of one of the favourite French rock stars, Johnny Hallyday. We stopped at the Palais Nikaïa in Nice, France,on the 25th of September for the second half of this technical and human adventure. The perfect opportunity to meet with Sébastien Rakotozafy and ask him about the use of Overline systems equipment on tour. Nice to meetyou, Seb Rakotozafy. First of all, could you introduce yourself? I am the General Stage Manager and Technical Director of the Johnny Hallyday tour for Décibels Productions. 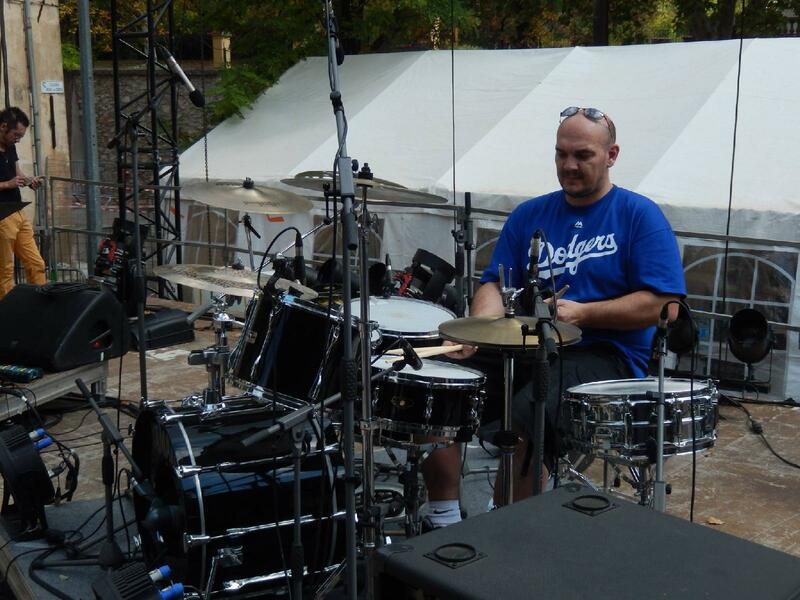 Musician by training, I have always been interested in the technical side of live production. I quickly realised that I was enjoying myself even more on that side of the stage. So I decided to continue down that path. First in dancing productions, parties and other live events at small venues and festivals, which allowed me to work on sound, lighting, logistics, etc. Then, from 1998, Is tarted working on music tours, first on back line, then on stage and now in control room and stage management. On the 2nd of July this year, you have started the Johnny Hallyday summer tour, a project you had been working on for months. Could you tell us about the key steps in the preparation of such an event, and when the Overline equipment came into play? So, on the basis of these previous experiences, I wanted to work differently on my latest tour with French artist Christophe Maé, and this is when I crossed path with Overline Systems. The idea was simple: a single system, a single provider and a single range of equipment. On previous tours and in TV studios I had the opportunity to work with the main 5 switch mobile (the Overline UC range). So I decided to contact the manufacturer directly. I met with Arnaud and Fred to share my ideas, but most importantly to explain my technical issues. This was the beginning of our collaboration and the results were spectacular, so it was clear: on a tour as massive as the Johnny Hallyday tour, I was going to require Overline Systems. The specifications were far wider, but I knew the team at Overline liked challenges. 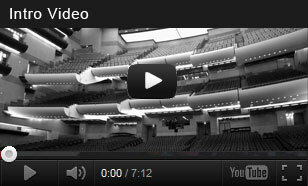 We often work on live performances like concerts, but tour are relatively recent for Overline. For anyone out there considering HF communication as an additional technical risk, let’s talk a bit about your organisation, the architecture put in place on every concert date. HF bases are naturally there. The HF is managed by the sound team who already overlook many frequencies between microphones and ear monitors. The specifications are complex because I have requested that every stage management mobile communicates with all the team and, at the same time, enjoy its own private loop, to exchange when needed, without interfering with other conversations. As for my own mobile, on the top of the intercommunication network, I use the mobile for Sound communication management with the musicians, and as an order. For this, my headset microphone and listening function are sent to the console. I receive the mix of intercommunication, of the musicians “talk” and of the sound - as well as the music - directly in my headset. A single mobile, a single headphone, a single microphone to talk to everybody. I just select on the beltpack the person I want to talk to, and who I want to listen to. You are constantly on the road in France, Belgium, Switzerland… The tour even took you to Lebanon. All this involves huge logistics. Are Overline systems’ products and services up to the challenge of a one year tour in term of reliability and peace of mind for your team before each new concert? 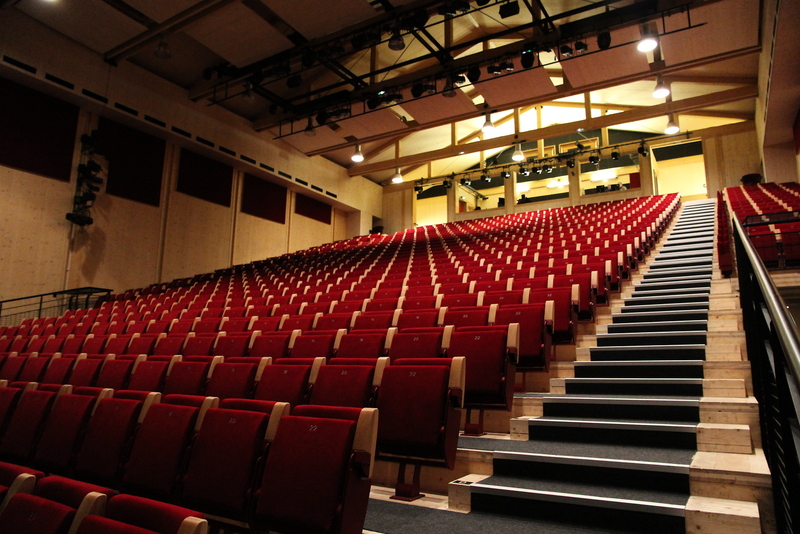 The architecture put together by Overline, once implemented in pre-production, remains exactly the same, concert after concert, until the end of the tour. Fred and Arnaud have always been available for my team and myself, and they are reactive. They don’t like to be stuck on a technical problem and even at 1am, if there is an issue, they will be on the phone. After a year and a half on tour with Christophe Maé, it happened only once. So I have no worries using Overline Systems. The only critical thing is to well manage frequency. You have also helped us to better approach the many challenges of musical tours, to optimise our systems in order to make them easier to use and more efficient. Do you know of any other things Overline could improve on its products or its services? Yes indeed, you have presented Overline with a very interesting idea, (and even a prototype) and - as which any Overline clients request, suggestion or issue – it had been the subject of an in-house study in order to better respond to your needs. Isn’t listening the basis of any good communication? Thank you for your time, Sébastien. We will be able to follow the results of this moment oustour all over France until 2016. Find all the concert dates and locations of the Johnny Hallyday – Rester vivant Tour on the Décibels Production website. Broadcasters from around the world came in September on the Overline Systems IBC booth to test our new OverWave Intercom / Reporter UHF broadband System. With sufficient outdoor range, no latency whatsoever and an unbeatable full duplex very high audio quality, it is clearly the most popular wireless Intercom and reporter systems around. The OverWave offers transmission and reception frequency over 72 MHz (9 TNT channels). At a time when telecommunication companies are purchasing so many made available UHF bandwidth, it comes as no surprise that broadband equipment appear as the best compromise. Our soon to be launched DigitEar wireless nano-in-ear solution also attracted many IBC visitors, everyone realising the true potentials of this state of the art development for their respective working environment. 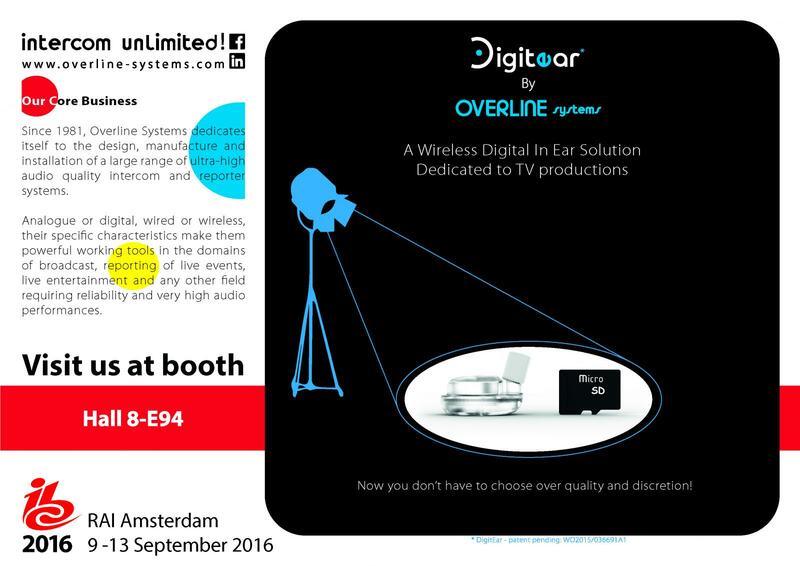 Overline Systems is passionate about intercommunication solutions: in HF, wired and soon nano-in-ear systems for TV presenters and performers. But first and foremost, it is a company dedicated to its equipment’s users, its clients and its partners who all contribute to the evolvement of our industry. The extraordinary win of Stanislas Wawrinka in the final of the 2015 edition of Roland Garros was broadcasted in over 214 countries. Technical teams were once again up to the challenge, facing increasing demand and ever more specific technical needs. Around the technical area, one can witness the many professions involved in broadcasting. Amongst them a production manager has agreed, with good humour, to share its views on the solutions provided by Overline Systems on this massive event. Sebastien Lelong embodies the versatility, the sens of involvement and the adaptability required on a project like Roland Garros. Could you describe, in a few words, your career so far and your job as a production manager? «I have been a production manager for over 15 years, including 10 years at VCF and the past 5 years at Euromedia. My job is to put together and coordinate the technical means and human capabilities on a broadcast which require audio and video knowledge. And I am good – or bad – at this, depending on where you look from! Rather versatile, I work on sets as well as on sporting events, in France and internationally. The Roland Garros tournament just came to an end. You were in charge of part of the project and you have chosen to use Overline Systems equipments. How were these two weeks? To whom and for what purpose the Overline solutions were implemented for? « We have used two different systems: the first one for the intercommunication between our HF teams across the entire site, with the Overline UC range of intercoms, and the other for our journalists’ communications, thanks to the boosted TX Ear monitor. All this on the same range, over two transmitters /receivers locations: the Suzanne Lenglen Court and the Philippe Chatrier Central Court. For how long have you been using Overline equipments and usually for what kind of jobs? You are one of these production managers who like to apprehend, discover and use a large variety of equipments and solutions (photography for example). The new series of Overwave HF broadband intercoms and DigitEar nano in-ear monitoring systems will be on the market soon. Could you picture yourself using these equipments on future jobs? … and it will be a pleasure to assist you in the process. We are looking forward to 2016! Monsieur Lelong, we wish you all the best for your current and future projects. And same to you all, production managers out there, and you of course, Overline Addicted! 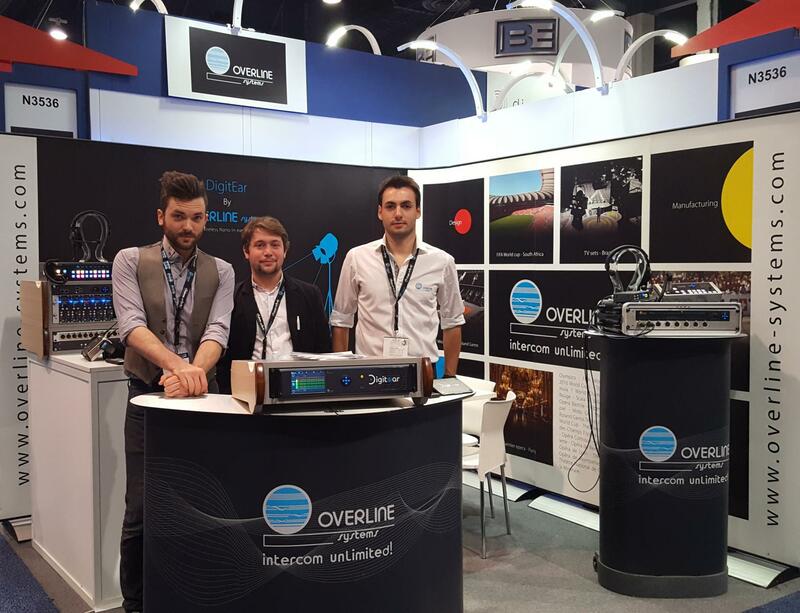 NAB Show 2015 : an exciting 3th edition for Overline Systems! This year was our third participation in the prestigious annual NAB Show Exhibition in Las Vegas. And what a few days it was ! A must for the broadcasting industry worldwide, this show is always a great opportunity for our team to showcase Overline Systems latest developments. Our in-ear monitor created a real buzz and visitors were thrilled by this ingenious wireless device. Fitted with in-built nanotechnology, the DigitEar offers a very high audio quality, a simplicity of use and a state of the art design that hasn’t been unnoticed. Many visitors, amongst them journalists, were looking forward to using the device in their studios. A manager of a preeminent American TV network summed-up the general feed-back: « Finally! I am glad it exists !! ». Our new OverWave wireless Broadband Intercom and Compass Wired ACS Intercom Systems were also the talk of the 2015 NAB Show. Visitors have been won over by the main features of the OverWave range of wireless Broadband Intercom. This include ultra long range, 8 selectable directions through 8 shift mode keys, operating on UHF very large band and full duplex very high audio quality. The Compass range of wired ACS Intercom Systems was also noticed by many of the professionals visiting the Overline Systems stand. Visitors were impressed by the quality of its clients worldwide: after the initial equipping of the prestigious Paris Philharmonic, Compass is now gaining grounds on the other side of the Atlantic, thanks to its plug'n play philosophy and its ultra high quality audio. Overline Overseas is now a true reality ! After 13 years in a company, it is not rare to meet passionate employees for whom technology, experience and service are inseparable values. At Overline Systems, Quality is a concept in motion through all segments of our activity, instrumental to technological prowess since 1981 and a result of the essential notion of personalised services. Let’s meet one of these actors, where technology meets the human factor. Fred Dutot - 42 year old - Manager of the Paris Overline Rental Agency, in charge of the coordination, preparation and set up of Overline rented equipments. As you decided to join the Overline team, 13 years ago, you immediately dealt with new challenges as you set up the Parisian office for rental & services. Following several years of experience in the audiovisual world and in particular in intercommunication, what was your motivation when you decided to continue your career in joining Overline? I was previously working for an American brand of intercom products and the possibility of being part of the adaptation of a technical solution to better answer specific needs immediately motivated me. The capacity of directly exchanging with end-users and always being receptive are powerful assets for a company manufacturing complete configurable and modular equipments. You are making a high priority of keeping this image of excellence which is - since its beginning - at the core of Overline philosophy, on a technological level but also in terms of customer relation.Project Management is the key ? Yes indeed, the key in our line of business is to work upstream, to adapt the condition of a system’s operation to a particular site, to a particular HF context, in harmony with other equipments used on site. This is the non visible, often unknown, part of the operation of equipments, but the key to a successful operation. So we offer a totally plug n’ play system on which it is easy and quick to intervene in case of an unexpected event. A successful frequency plan calculation eventuates when a project is a total success. Which advice would you give to a technician using HF and Overline Systems for the first time, in order to start on solid ground and make regular improvements with a few simple notions? A successful set up of Overline HF equipments starts with the understanding of the global environment in which the system will be used. Taking into account all the HF equipment (microphones, ears, orders…) is already a first step towards success and the best possible set-up, of which antennas positioning is the keystone. From this series of information, the idea is to spread the systems’ antennas as much as possible in order to use the Overline bases in the best conditions possible, respecting the work of every technician involved. Laurent Aubert is part of the AMP Visual TV company where is started as an assistant over 7 years. AMP is a specialist in TV Coverage, providing services throughout the production process for live programmes and those produced under live conditions. 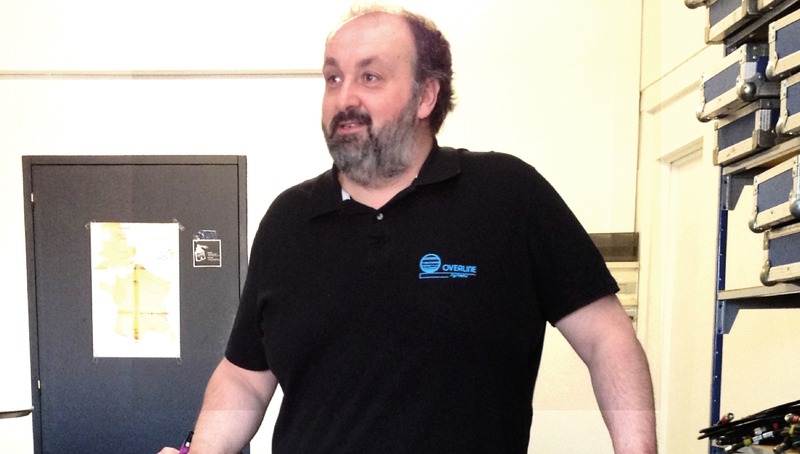 Laurent first started to use Overline systems at the time and since then has always been “very satisfied of these complete intercommunication systems”. Dorian MARTIAL, Overline Systems Sales Manager has briefly talked to him on stage at this year “Les Enfoirés” Live performance. "I appreciate the user friendly aspect of Overline systems, their in-ear comfort thanks to a very high audio quality, their precise handling as well as their ease of operation. They are crucial for us on “les Enfoirés” stage because they are adapted to our needs. The systems are easy to configure and the set-up lead time is very short : less than an hour to install the base, positioned the antennas and proceed with the tests . As many people in the industry, I am looking forward to the release of the new InEar wireless monitoring solution which should replace the Phonaks in the near future". 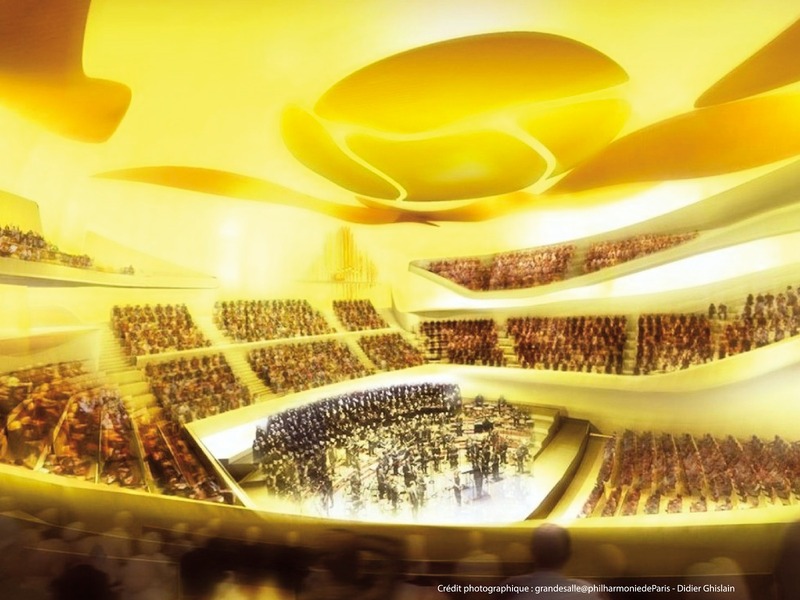 Conceived as an artwork by architect Jean Nouvel, the Paris Philharmonic brings together the Cité de la Musique (Philharmonic 1) and a new facility offering a 2400 seat auditorium (Philharmonic 2). 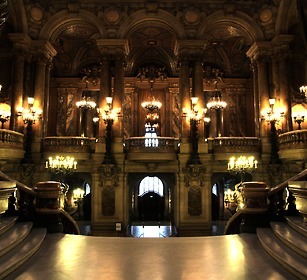 In this exceptional concert hall, no spectator is further than 32 metres from the director. This real architectural prowess was conceived in order to offer maximum modularity, not only in terms of layout - the main space has exceptional modular acoustics - but also in terms of space usage : the area can be used as a reception as well as an exhibition hall and the foyer can host workshops or be a networking area for visitors. The intercommunication technical specifications were to be in harmony with the high requirement of this prestigious site. The system had to allow permanent or visited technical teams to inter-communicate between each other to and from the different sites hosting various cultural events. For ease of usage and team security, this intercommunication had to be full duplex. For similar reasons, communication at all time had to be of a very high quality. The system had to be intuitive and easy to use, without prior training, by various technical teams invited to work onsite. It had to be modular, both in terms of its physical architecture - with the possibility of adding modules and interchange mobile unit to suit needs - and in terms of its functionality, with possibilities to set up stand alone or conference mode intercommunication networks. It had to be reliable through its toughness and an efficient after sale service. Last but not least, the system had to harmoniously fit within this high profile architectural achievement. Overline was able to meet all of these criteria, offering a solution based on both wired and HF intercommunication, and guaranteeing a very high quality full duplex audio across the overall network. We wish you an Unlimited year ! This year, more than ever, let’s invest all our energy in surpassing ourselves, pushing technological limits, overtaking geographical constraints and, first and foremost, promoting freedom. Our trade only makes sense through freedom of expression in art and information. Let’s approach 2015 as citizens of the world, with solidarity the only answer to violence. 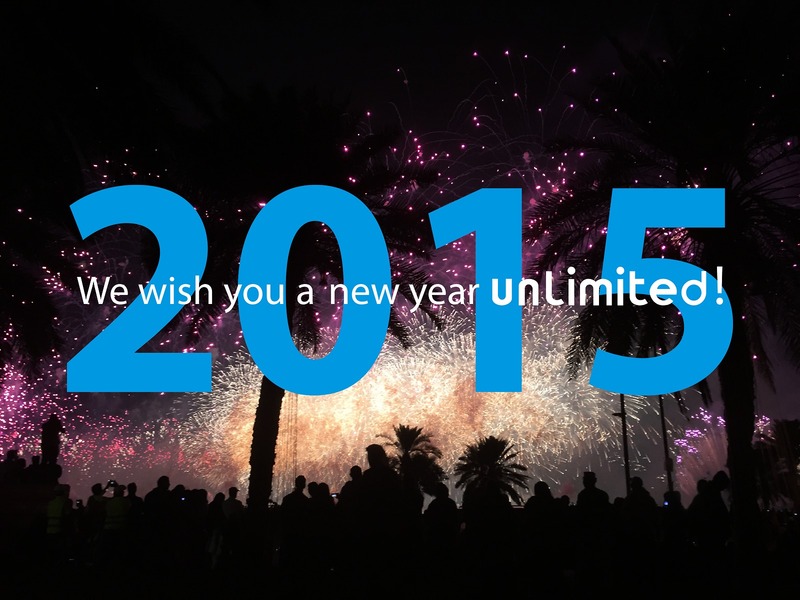 All the team at Overline wishes you an unlimited year! 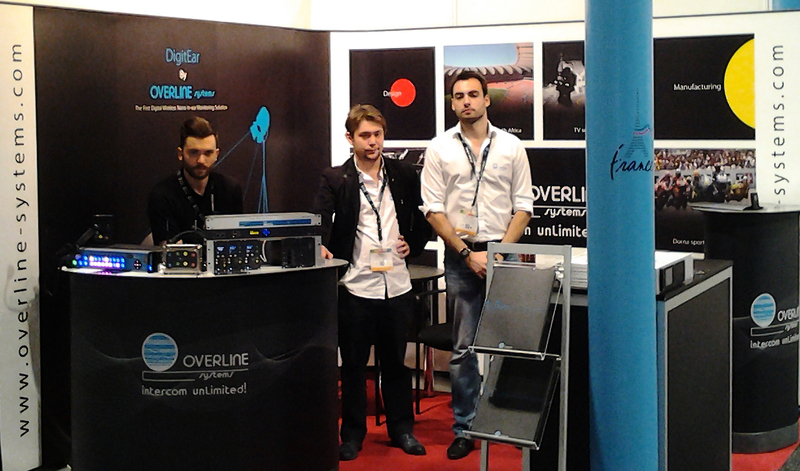 JTSE 2014 : Overline... always there ! 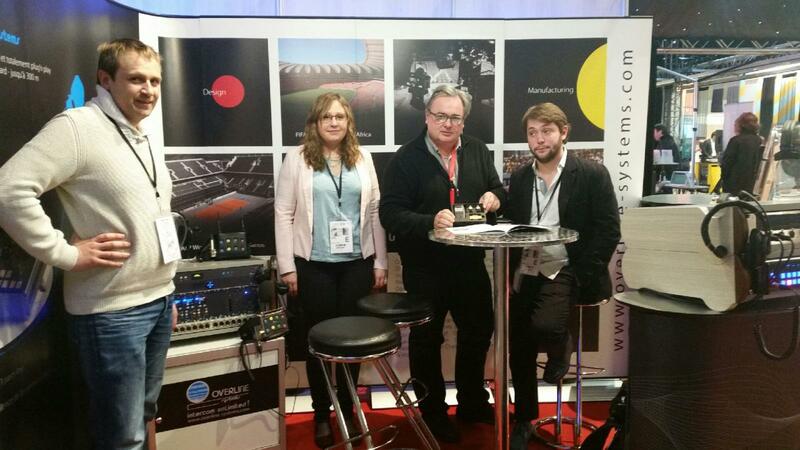 As with each year,OVERLINE Systems was a proud exhibitor on JTSE 2014, the Performance and Entertainment Technical Show and Convention (Paris, 25 & 26 November). Another perfect opportunity to exchange with the industry, to strengthen the links between the artistic and the technical in the performing arts, and to present the key advantages of the OVERLINE COMPASS range of wired ACS intercom systems for theatres and operas. 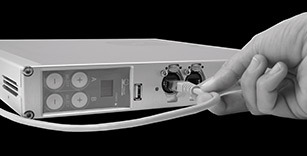 With a new design and ergonomic optimizations, its total plug'n play configuration and its 4 full duplex channels on ACS DP/ACS SP keyboards bringing very high audio quality, the COMPASS range of wired Intercom continues to win over supporters from prestigious venues around the world and is fast becoming THE wired solution worldwide. A masterpiece of ingenious design, the Fondation Louis Vuitton is a symbol of French excellence. 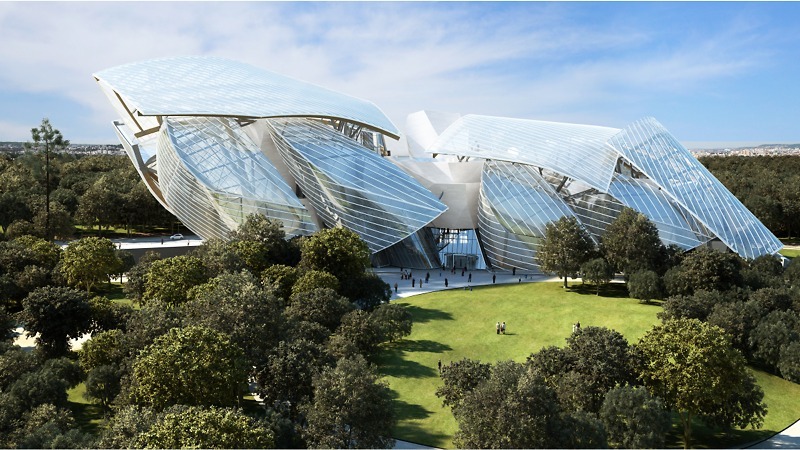 American architect Frank Gehry and the Fondation have paid attention to every detail of the project, surrounding this extraordinary space for art and culture with luxury and French high technology. Overline has integrated its intercom architecture at the heart of this “cloud of glass” : a HF intercom system with 8 mobiles on two networks allowing technicians to communicate to each other virtually anywhere in the building, from the boxes to the stage surrounds and the gallery halls, lobby and corridors. Year after year, Overline is proud to uphold the tradition of French excellence ! 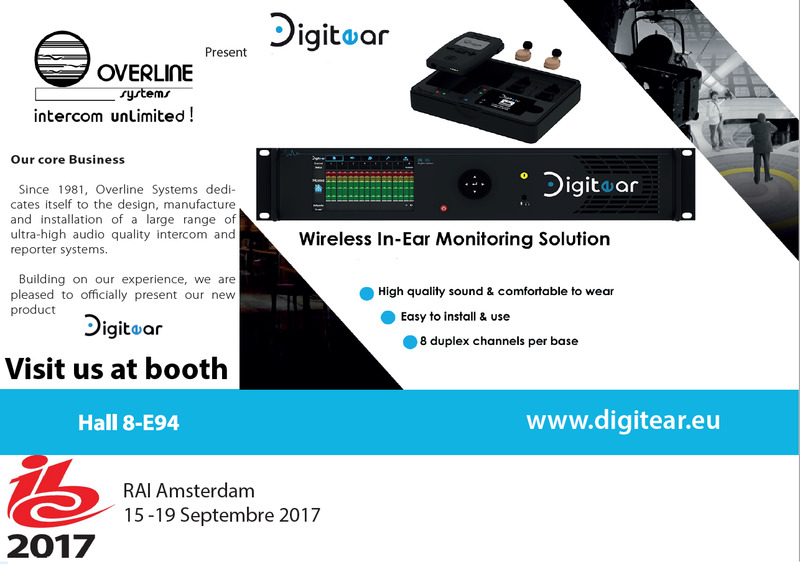 Overline Systems has taken the opportunity of this year's IBC exhibition to introduce its latest gem : the DigitEar. 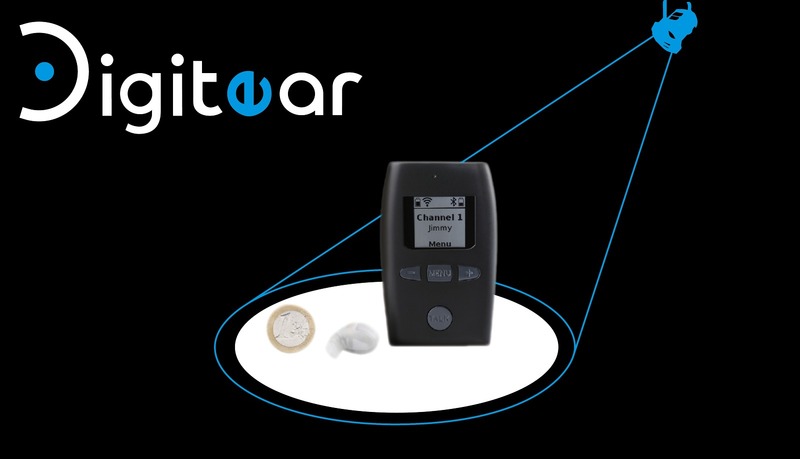 DigitEar is a wireless nano in-ear monitoring system especially designed for journalists, newsreaders and TV hosts. Based on miniaturised high technologies, the Nano In-Ear is a perfectly invisible intra-auricular device. A discreet Intermediary Pocket Station links the Nano In-Ear to the full duplex base station. 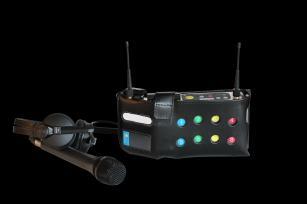 A “Talk-back” functionality allows communication with the duplex station thanks to an inbuilt microphone. This provides a variety of uses. Very high quality digital audio sound, wireless “nano” technology, variety of uses: DigitEar is “THE” in-ear monitoring solution for those wanting discretion without compromising on quality. NAB Show 2014: visitors thrilled by the First Digital Wireless Nano In-ear Monitoring Solution! 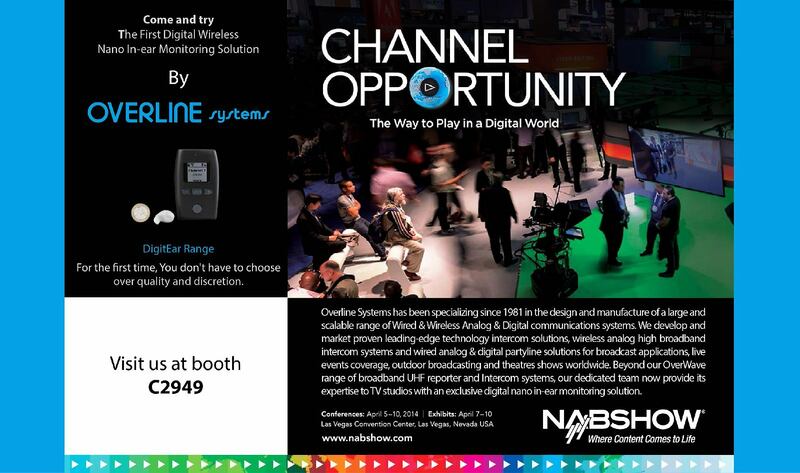 The 2014 edition of the NAB Show has been a great opportunity for Overline Systems to showcase our new digital nano in-ear monitoring solution. With this new digital and wireless device, users won’t have to compromise: the DigitEar provides great efficiency while allowing maximum discretion. Visitors to our stand have been won over not only by the DigitEar’s very high audio quality but also by the many possibilities offered by this new solution. 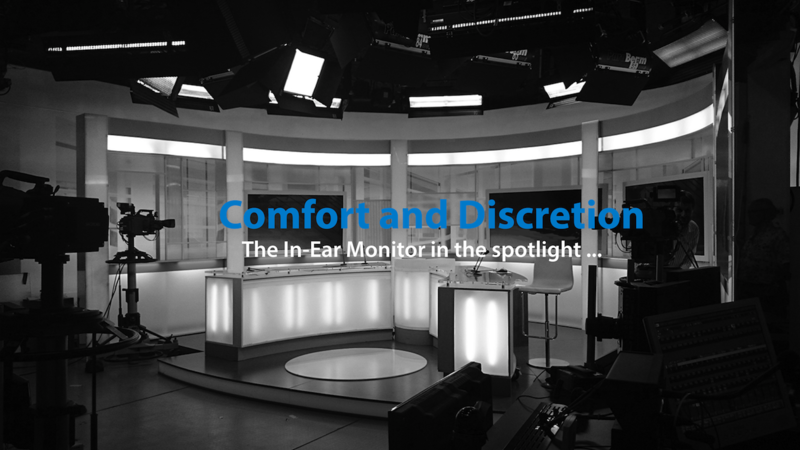 ​The wireless Nano In-ear talk-back function is a little revolution in itself: think being able to talk back to your control room during a live coverage thanks to an ingenious control box small enough to go unnoticed on a table. Our new OverWave wireless Broadband Intercom and Compass Wired ACS Intercom Systems were also the talk of the 2014 NAB Show. ​More than ever before, 2014 is the year of achievement and new projects for Overline Systems! Overline Systems has been specializing since 1981 in the design and manufacture of a large and scalable range of Wired & Wireless Analog & Digital communications systems. For the first time, you don’t have to choose over quality and discretion! A new year begins, this is the opportunity for us to thank you again for the confidence you have placed in us over many years. Our collaboration and your fidelity are the the keys to our success. We wish you a happy new year 2014. Once again this year, the Overline Systems team was present at the IBC to reveal a preview of the 2014 innovations. The announcement of the new RF wide band intercom and reporter system OverWave created the event within the broadcasters’ world. Indeed, having a system that can answer the UHF channels loss problem was more than expected in the current context. There has also been talked about the new Compass wired system, based on an Overline original technology between digital systems and classic party-line, capable of supplying 4 audio channels for beltpacks and panels stations, on a single 300 meters regular microphone cable, with no side-tone adjustment needed. All the partners welcomed the total compatibility between all the products (wireless RF OverWave systems, Compass 4 channels wired analog system and EIS Ethersound panels) . They can now access a complete intercom solution with an ultra-high audio quality and exclusive features. Left to right: Matthieu Fischer, operational manager / Gérard Lombard, CEO / Dorian Martial, sales manager / Gilbert Pernin, Consultant. Join us to IBC show ! The Overline team is still in race ! One more time, Overline systems pushes away the limits of the HF by operating the TV cover of the biggest automobile long-distance race. Le Mans 24 Hours, mythical event of the car-racing, constitutes a real challenge for 7 televisions teams. For its 90th anniversary, the event requires at least 9 systems of very long distances UHF reports for live coverage and 20 intercom systems for the team coordination. 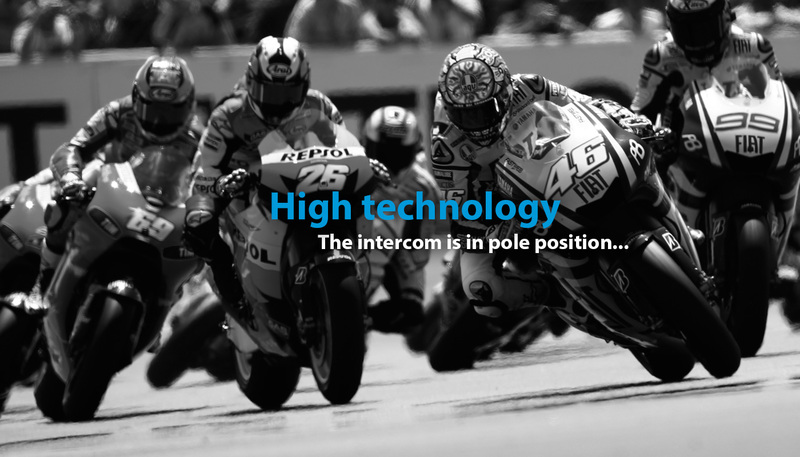 Strong and reliable, the Overline-Systems remain, to date, the only ones to be able to cover in HF the incredible long distances of a racing circuit. Drawing on their proven experience in this field our teams can congratulate themselves on such a success. More and more televisions trust our systems for their television report and we thank them all for their support. Overline takes on the yellow jersey for the 10th time of this year ! For 10 years Overline has been following the competitors of the Tour de France, again this year, the rental team is mobilized to cover such an event. 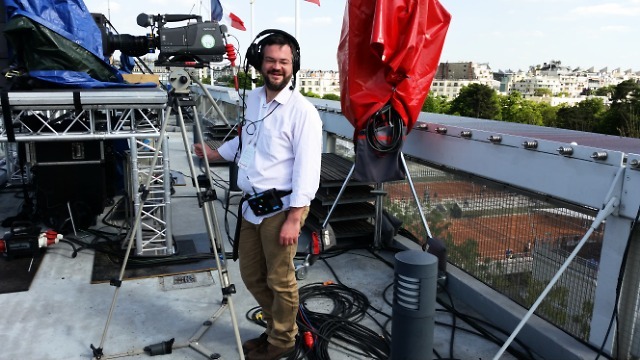 France 2 (French national TV) to equip Gérard Holtz with a mobile reportage for live broadcasting from the departure village, accompanied by the assistant director and 2 TV cameras HF equipped with mobile intercoms. France 3 (French national TV) at the arrival line making live broadcast, with their: UHF reportage systems with 2 deported antennas by optical fibre on top of a 45 meters crane so they can cover the entire arrival line. On top of this same crane they also have a intercom system with double deported antennas, including 5 mobiles for the several assistant directors, one mobile organizer and 2 mobiles for the TV cameras HF. Two other bases of 4 mobiles are also on site for the sound assistants. 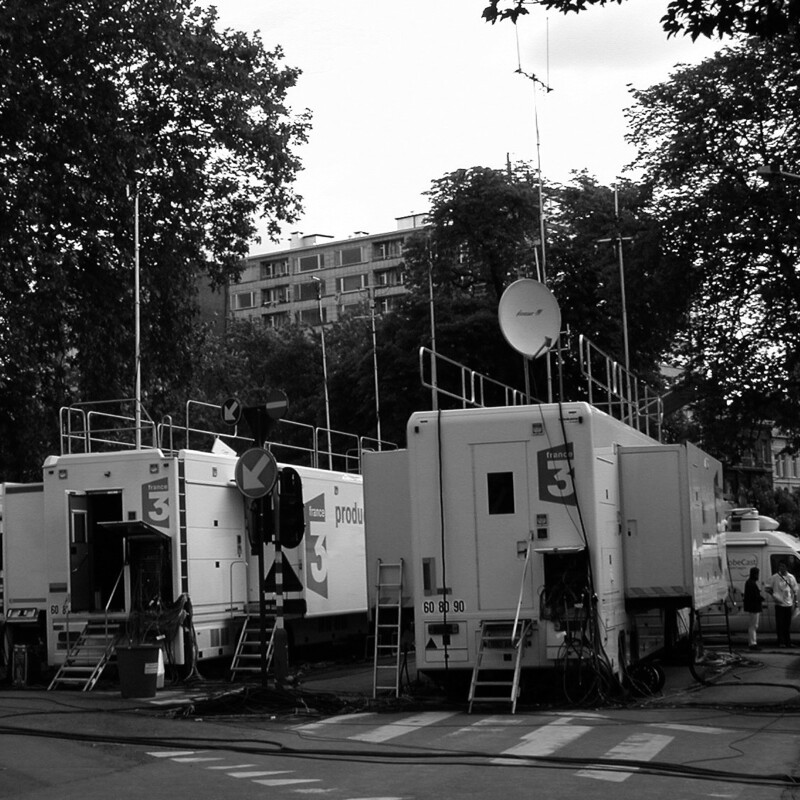 We also equip for the live broadcast with mobile reportages: the journalists of Eurosport (with Visual TV), RMC* -French radio – (for the rent-service part), RTL - French radio- and Itélé (French TV channel) on the arrival line and BFM (French TV and radio channel) who are already equipped with intercom mobiles. For the different caravans of the Tour, we have studied a system of a HF bridge, allowing us to remotely transit the audio by radio frequency between the caravans. For its numerous performances during the July festival, the 'Chorégies d'Orange' are equipped with an Overline High Frequency system interfaced with the new-wired system in EtherSound. Considering the surface to cover and the thick stonewalls of this antique theatre, the success of the festival relied on a trustful HF that could meet the requirements of such a site without any problems. Based on a system of 8 HF mobiles, the EtherSound central intercom system and the 16 wired mobiles complete this mobile intercom architecture. 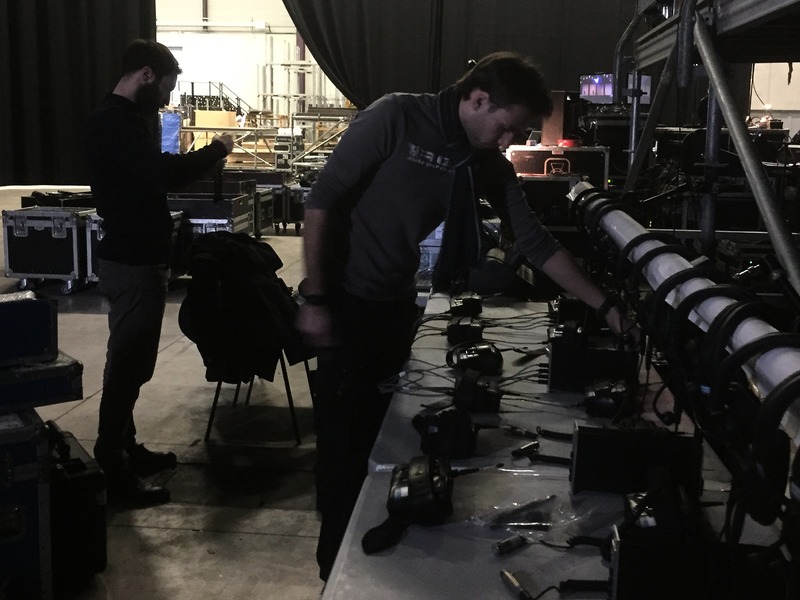 Feat of the wired system, the devices cover the entire infrastructure, from the production stage team up to the followspot with coverage of up to 100 meters. Despite the topology of the site the network has been built in all simplicity, with the help of the system plug and play and the automatic setup of the wired system, allowing more flexibility in the organization of such shows. 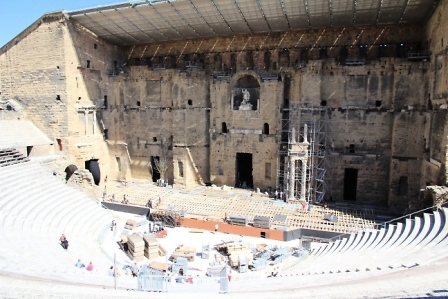 'La Comédie française', one of the most ancient and prestigious places of French culture, has chosen the reliability of Overline Systems to equip its 'Théâtre Ephémère'. Situated just next to the famous Richelieu auditorium currently under renovation at the moment, this theatre is the opportunity for Overline to be approved by the technical teams of the 'Comédie' on its new wired range EIS. The simplicity of the setting up and its inexpensive wiring makes it an ideal system for this type of site. Its exceptional audio quality and its extreme user simplicity seem to have seduced the team, as there is question to reinstall this system in the Richelieu Auditorium once the renovations are completed !